Russian Jazz World is a non-government public initiative with a goal to represent on the international level the jazz scene in Russia, and the Russian jazz artists who reside in Russia or in other countries, as a living and lively community of jazz schools, clubs, festivals, promoters, researchers, broadcasters, journalists and, most significantly, hundreds of jazz musicians. Since 2016, we represent Russia’s jazz scene at jazzahead! as the country’s national umbrella stand. For complete 2018 Jazz.Ru Magazine’s coverage (in Russian,) click here! See you at 14th jazzahead! on April 25-28, 2019! Jazz Across Borders—international jazz forum & festival in St. Petersburg, including a professional conference, a showcase program, a club night, a trade fair, and a Gala concert with a star lineup! Igor Butman Music Group—Russia’s premier jazz conglomerate which includes a record label (Butman Music Records,) a festival/concert production company, Igor Butman Jazz Club in Moscow, and artists management for musicians associated with the projects led by saxophonist Igor Butman, Russia’s leading force in jazz music. The festivals produced by IBMG include: Triumph of Jazz (Moscow and St. Petersburg,) Sochi Jazz Festival, World Jazz Festival (Riga, Latvia,) and many others! 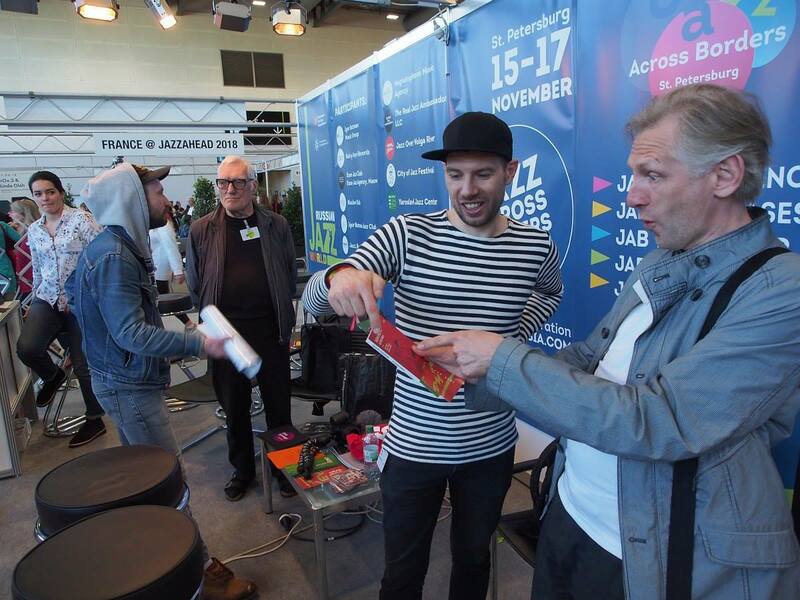 At the Russian Jazz World stand, April, 2018: L-R Evgeny Petrushansky (Rainy Days Records,) Jerry Teekens (Criss Cross Records,) and drummers from Russia (Sasha Mashin) and Estonia (Tanel Ruben) exchange their latest CDs!